“Charlie and the Chocolate Factory” exists in a variety of forms. It started with a children’s novel published in 1964 by British author Roald Dahl. Its second incarnation was “Willy Wonka & the Chocolate Factory,” an Academy Award-nominated musical fantasy in 1971 starring Gene Wilder as Willy Wonka. Next was “Charlie and the Chocolate Factory,” an American film released in 2005. Johnny Depp, who starred as Willy Wonka, was nominated for the Golden Globe Award for Best Actor in a Musical or Comedy. Then came “Charlie and the Chocolate Factory,” a stage musical based on the 1964 novel with music by Marc Shaiman. The musical premiered in London’s West End at the Theatre Royal Drury Lane in June 2013 and ran for 3 years and 7 months before closing in January 2017. Moving right along, the show was reworked for a Broadway production that opened in April 2017 at the Lunt-Fontanne Theatre. The Broadway show ran almost nine months before closing in January 2018. The latest version is the National Tour of “Charlie and the Chocolate Factory” – a tour that is being presented now through November 18 at the Academy of Music (Broad and Locust streets, Philadelphia, 215-731-3333, www.kimmelcenter.org) as Part of the Kimmel Center’s 2018-2019 “Broadway Philadelphia” series. The tour features Noah Weisberg as Willy Wonka, James Young as Grandpa Joe and Amanda Rose as Mrs. Bucket. “This is the first production of the show that is going out on the road,” said Young, during a phone interview last week from Moab, Utah. “It originally was just a London show and then went to Broadway. Our director Jack O’Brien was also the Broadway director. He thought the Broadway production was too over the top and wanted a smaller production for the U.S. tour. The story was originally inspired by Roald Dahl’s experience of chocolate companies during his schooldays. Cadbury would often send test packages to the schoolchildren in exchange for their opinions on the new products. At that time (around the 1920s), Cadbury and Rowntree’s were England’s two largest chocolate makers and they each often tried to steal trade secrets by sending spies, posing as employees, into the other’s factory. Because of this, both companies became highly protective of their chocolate-making processes. It was a combination of this secrecy and the elaborate, often gigantic, machines in the factory that inspired Dahl to write the story. 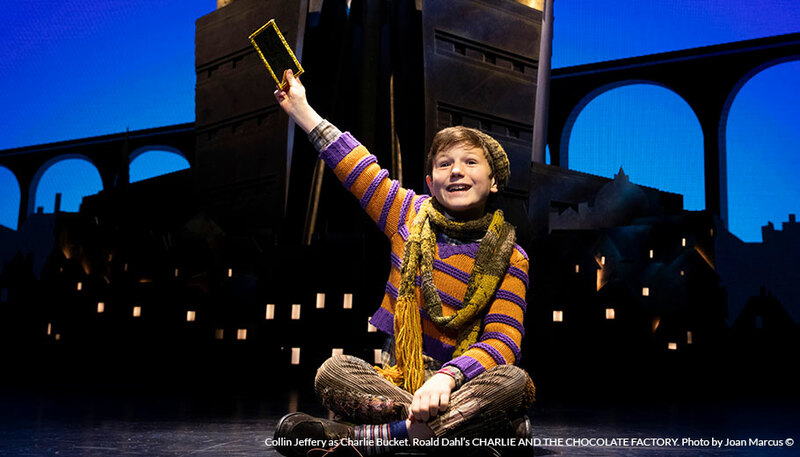 Willy Wonka is opening his marvelous and mysterious chocolate factory…to a lucky few. That includes Charlie Bucket, whose bland life is about to sweeten with color and confection beyond his wildest dreams. Bucket, an 11-year-old, lives in poverty in a tiny house with his parents and four grandparents. His grandparents share the only bed in the house, located in the only bedroom. Charlie and his parents sleep on a mattress on the floor. One day, Grandpa Joe tells him about the legendary and eccentric chocolatier, Willy Wonka and all the wonderful candies he made until the other candymakers sent in spies to steal his secret recipes, which led him to close the factory forever. The next day, the newspaper announces that Wonka is reopening the factory and has invited five children to come on a tour, after they find a Golden Ticket in a Wonka Bar. Each ticket find is a media sensation and each finder becomes a celebrity. The first four golden tickets are found by the gluttonous Augustus Gloop, the spoiled and petulant Veruca Salt, the gum-addicted Violet Beauregarde, and the TV-obsessed Mike Teavee. One day, Charlie sees a fifty-pence coin (dollar bill in the US version) buried in the snow. He then buys himself a Wonka Bar and finds the fifth golden ticket. The ticket says he can bring any family members with him to the factory and Charlie’s parents decide to allow Grandpa Joe to go with him. After meeting Wonka, the kids and their parents go inside where they meet Oompa-Loompas, a race of small people who help him operate the factory since he rescued them from poverty and fear in their home country Loompaland. The other kids are ejected from the factory in comical, mysterious and painful ways, befitting their various greedy characters and personalities. Augustus gets sucked up the pipe after falling into the Chocolate River in the Chocolate Room, Violet blows up into a giant blueberry after sampling an experimental three-course chewing gum meal in the Inventing Room, Veruca is thrown down the rubbish chute in the Nut Room after the nut-testing squirrels consider her a “bad nut,” and Mike gets shrunk after he tries to be the first person to be sent by television in the Television Room’s Television Chocolate Technology. “This is a show about hope,” said Young, who was in Utah on a break from the show to attend his daughter’s wedding. “There are some real good lessons in it – like pulling everyone together. “The film came out in the early 1960s. It’s pretty iconic. We use songs from the movie and our writing team has written some new songs. “Gene Wilder, who played Willie in the original film, was great. Our Willie, Noah Weisberg, is wonderful. He still finds the dark edge. “There is a dark edge but it’s still good for children. We haven’t heard any kids crying out there. One constant factor in all the story’s incarnations – people love it. Video link for “Charlie and the Chocolate Factory” – https://youtu.be/x0nN99ljvFk. The show is running now through November 18 at the Academy of Music. Ticket prices range from $25-$139. A self-described “Nashville record,” Landes’ “Meet Me At The River” was produced by Country Music Hall of Famer Fred Foster (Dolly Parton, Roy Orbison, Kris Kristofferson). Only sporadically producing for friends like Willie Nelson, Merle Haggard and Ray Price, Foster produced “Meet Me At The River” and it was the first time that Foster has taken on a new act in years. Landes was raised in Louisville, Kentucky, and Branson, Missouri, and spent years in New York’s music scene, where she cultivated her musical gifts not only through performing and songwriting, but also through learn-by-doing production work that eventually led to co-owning a recording studio. She first established herself in the New York indie music scene as a recording studio engineer. At the same time, she was starting to develop a career as a performer – a singer/songwriter/multi-instrumentalist in New York’s “Fast Folk” community. “I’m a recording nerd,” said Landes. “I love the ins-and-outs of production. I wanted to make a record that sounded like classic Nashville. “At first, Fred thought I was just a singer coming to him to look for songs. Each meeting, I’d bring him my songs. He gave me some assignments to cover songs. Eventually, I won him over as a writer. That’s what kick-started it. The 12-song collection on “Meet Me At The River” features some of Nashville’s most acclaimed musicians, including Eddie Bayers, Charlie McCoy, Bobby Wood. “The difference between this and my previous albums is that this is getting labeled as country,” said Landes, who had four previous albums. “That hasn’t happened before. Previously, I was labeled as folk and indie rock. 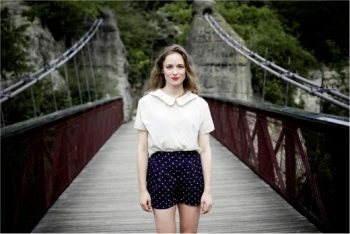 Video link for Dawn Landes – https://youtu.be/13KUpN48dv8. The show at The Locks at Sona will start at 8 p.m. Tickets are $15 and $20. Another act that is touring in support of a new album and bringing that tour to this area is Devildriver. On November 7, Devildriver — Dez Farfara, Vocals; Mike Spreitzer, Guitar; Neal Tiemann, Guitar; Diego Ibarra, Bass; Austin D’Amond, Drums — is headlining an all-ages show at the Chameleon Club (223 North Water Street, Lancaster, 717-299-9684, http://www.chameleonclub.net). “‘Outlaws’ was an exercise in old meets new,” said Tiemann, during an interview Monday. “Of course, we brought the tried and true Devildriver sound but there was an honest effort to incorporate some old western sounds. Devildriver has never made a record like “Outlaws ‘Til The End” before. But then nor has anyone else. The perfect marriage of badass country grit and neck-wrecking groove metal supremacy is a game-changer delivered by true heavy metal outlaws. But, there were some challenges making this type of songs. “Song choice became a hurdle at one point,” said Tiemann. “A few of the primary picks didn’t make it because we couldn’t find the right feel. An example would be ‘Tiger by the Tail’ by Buck Owens. I wanted to do it, but we just couldn’t find the correlation. “My favorite track is ‘If Drinkin’ Don’t Lill Me’ — for sure. Wednesday ruled that song. I’ve been a George Jones fan for a while and am super happy this one made the cut. 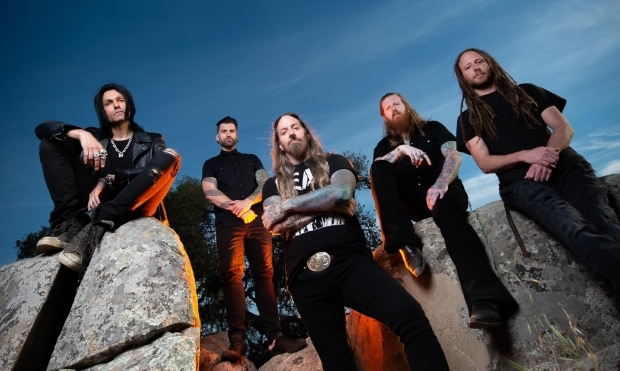 Devildriver is already on its way to making a more traditional album. “Mike, Austin, and I just finished up the music for the next double album of originals one week before the start of this tour,” said Tiemann. “On this tour, we’re currently playing ‘Whiskey River’ and it’s going over great. Since it’s a cover record, we’re still focusing on our originals and just using these as a spice, if you will, to the set. Video link for Devildriver – https://youtu.be/hlDPWmwO7SU. The all-ages show at the Chameleon Club, which also features Jinjer, Raven Black, One Day Waiting, and Andhera, will start at 5:30 p.m. Tickets are $18.